Mommy Makeover: Update your ‘do for Summer! Give your old look a fresh twist in time for the hot summer months! A fresh hairstyle can do wonders on your overall look and your confidence – it can make you feel really good about yourself. As moms, we sometimes tend to stick to our old styles especially when we're busy caring for the baby or with the household chores, so if you’ve been sporting the same ‘do for a long time already, here are some suggestions that are easy to recreate and/or maintain. 1. "I keep my hair always at shoulder-length." If you wear your hair shoulder-length, try face-framing haircuts that aren’t too drastic a change from what you’re used to. Try a layered haircut with side-part bangs to reduce the appearance of a high forehead which is common to women with an oval-shaped face. Soft layers at the front add dimension and create a little width on the jaw area which is perfect for those with a longer facial structure. 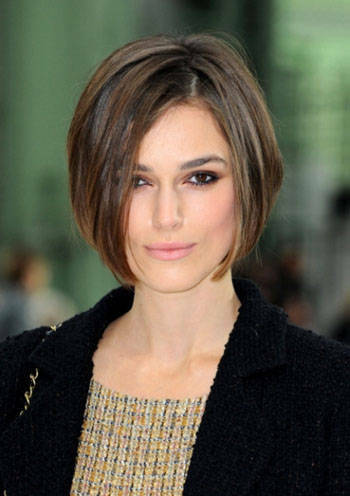 An angled bob that falls right on the chin will soften strong jaws and make your face appear longer. If you have a round face, keep your hair as close to your face as possible as this creates an illusion of a thinner face. Soft layers on the bottom will help frame your face better and give you a fresh new look. Hide a wide forehead with side swept bangs and add minimal layers on the bottom for a soft finish.